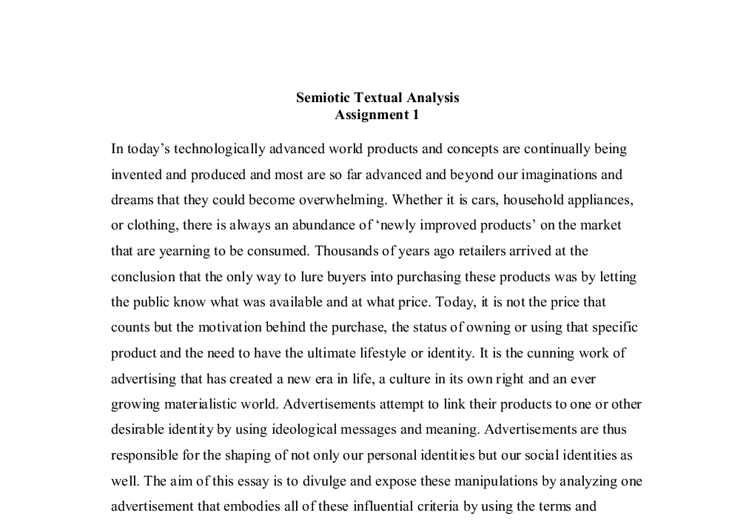 Semiotic Textual Analysis Assignment 1 In today's technologically advanced world products and concepts are continually being invented and produced and most are so far advanced and beyond our imaginations and dreams that they could become overwhelming. Whether it is cars, household appliances, or clothing, there is always an abundance of 'newly improved products' on the market that are yearning to be consumed. Thousands of years ago retailers arrived at the conclusion that the only way to lure buyers into purchasing these products was by letting the public know what was available and at what price. Today, it is not the price that counts but the motivation behind the purchase, the status of owning or using that specific product and the need to have the ultimate lifestyle or identity. It is the cunning work of advertising that has created a new era in life, a culture in its own right and an ever growing materialistic world. 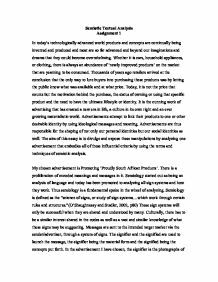 Advertisements attempt to link their products to one or other desirable identity by using ideological messages and meaning. Advertisements are thus responsible for the shaping of not only our personal identities but our social identities as well. ...read more. makes one feel as if he is calling out to you for help. This forges a relationship between the reader and the photo instilling a sense of personal responsibility in the reader towards helping the child and all children and less fortunate people like him. The photo underneath conjures up the opposite feelings in the reader. A photo of a happy young schoolboy dressed in clean, crisp clothing, with clean braided hair in what seems to be a safe environment due to the clean, newly painted wall makes the reader feel at ease, as if all is as it should be. He now wears a tie which is green and is thus symbolic of the brands coulour. The bright light in this photo illuminates his face, thus emphasizing his cleanliness as the light shines on his forehead and nose. It also symbolizes the fact that he is radiantly happy. These two photos both resemble family photos as If they are being taken on the first day of school for instance. This fact further establishes feelings of tenderness towards the young poverty stricken boy because he is disadvantaged and enhances feelings of wanting to reach out and help all little boys just ...read more. In conclusion, it has been shown how this advertisement, its images as well as its texts, work systematically together to sell its anticipated service. By drawing on feelings of guilt, responsibility and patriotism towards ones country we see how the advert is victorious because it works. It offers consumers an incentive to buy their products- consuming them would improve lives ubiquitously. At the same time as offering motivation, it also provides a good excuse to use the products more frequently. It is imperative to note though, that this advert has cultural constraints because if you do not share in the South African beliefs, then this advert may render useless. However in the context it is found the advert is triumphant in the task it sets for itself. It accomplishes its goal by combining all the different sign systems and putting them to good use. So we can see how semiology is a helpful method of taking apart images. It serves as a guide through all the mazes of meanings and stresses the relation of one text to others and to society as a whole -It allows us to see meaning as socially constructed. A powerful yet deceiving advert once again prevails. ...read more. For example, if the model was carrying a tennis racket the syntagmatic structure would diminish- it would not make sense. The colours within figure 4 also create a syntagmatic structure- the blue shirt of the male model along with the perfect blue sky in the background all create a syntagmatic pattern within the body of the printed advertisement. The main colour used in advertisement 2 is red, as it is the colour of the background, one of the gambling chips, and three of the king symbols and suit. Other colours include white, which is the background colour of the playing cards and the text on the advertisement. Offering free cooking recipes would provide necessary education on using the product, and free samples would promote brand recognition. Emerging markets always bring challenges but at the same time they offer great opportunities for early entrants who know how to position themselves in these new environments. Poland is no exception. is supported by an ethical stance & approach it becomes an false manipulative attempt to buy a caring image. The WWF link with Procter & Gamble, could have been seen as controversial, with the debate over the environmental-friendliness of disposable nappies & that the benefits to the manufacturer outweighing those accrued to WWF. the real world, which is one of the key messages in the advertisements. The non-verbal communications in all three advertisements are examples of presentational codes. They can also be described as indexical signs because people have learnt throughout their lives that certain gestures etc are associated with a certain meaning. have too many tables on the introduction page to confuse people about what to do. Their is also the use of too many colours which is not necessary, use of colour is good but having a theme of a few colours is better otherwise it just ends up looking cheap and not serious enough. These are in bold to catch the reader's eye and the show that the text is separate to Madans writings. The leaflet is set out so that the text is in two columns, like the structure of a newspaper article, with line numbers and blocked text.